With their marriage on the brink, Ron and Susan embark on an existential journey to nowhere. Along the way, they find wisdom from the most unlikely of sources. A cross-country pilgrimage becomes a metaphor for life in this intense and thought-provoking drama. A cross-country pilgrimage becomes a metaphor for life in this intense and thought-provoking drama from award-winning filmmaker Clint Cullum. 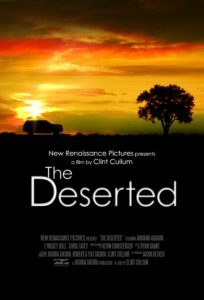 The Deserted is Cullum’s feature film debut and its introspective narrative brings us into a unique world of profound and life-changing ideas. Inspired by the artistic and experimental films of Europe’s great filmmakers, Cullum capitalizes on their techniques while bringing a fresh look and a distinctly American feel to the film. Contact us for a screener copy of The Deserted.